The promise of augmented reality when it comes to gaming is the conversion of the player's real-world environment into a virtual playground. Army of Robots, available for $1.99 in the App Store for ARKit-compatible devices, gives us a tangible example on how the promise could be fulfilled for the first-person shooter format. The developer, Sinergia Studios based in Brazil, let us give the game a test run. Upon entering the app, the game scans the environment for horizontal surfaces, a ritual that will become familiar with the current generation of ARKit apps at least. This gives the game parameters within which to deploy enemy robots for players to shoot. ARKit's world-sensing abilities are as-advertised here; I walked to another room and returned to find the area populated with digital robots. Once the game begins, the iPhone or iPad screen and camera view become the player's heads-up display. 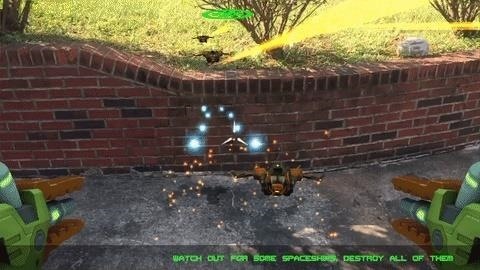 AI opponents appear on the ground and in the air, with red arrows guiding the player when mechanical enemies appear off screen. 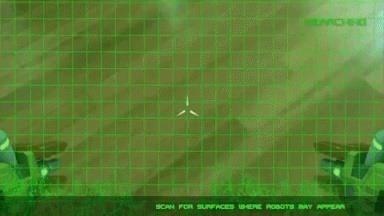 Turrets are pinned to the lower corners of the screen with the target placed in the center. Players are able to fire by tapping anywhere on the screen. Players complete a stage once all enemies are cleared. My aim was less than precise, so it took me numerous rounds to take each robot down. Enemies fire back as well, and players must move their device to avoid getting hit. The game works inside and outside, though it struggles with detecting certain outdoors surfaces. For instance, the game had difficulty targeting white concrete in direct sunlight, but it faired better with that surface in shadows. This would appear to be more of a shortcoming with ARKit than the game itself, though. I also found that the game loses its world tracking during multi-tasking, so playing this game with "do not disturb" enabled is recommended. My twelve-year-old son, an avid gamer in his own right, gave the game a spin as well. 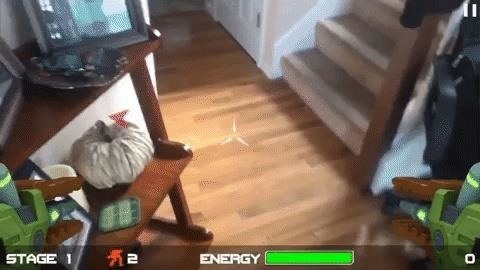 This was his first experience with an ARKit game, so his first impression was amazement. However, he lost interest relatively quickly. Ultimately, that is my conclusion as well. I'm not sure there is enough replay value for this game. As a proof-of-concept, though, it is worth its current price to get a taste of ARKit.